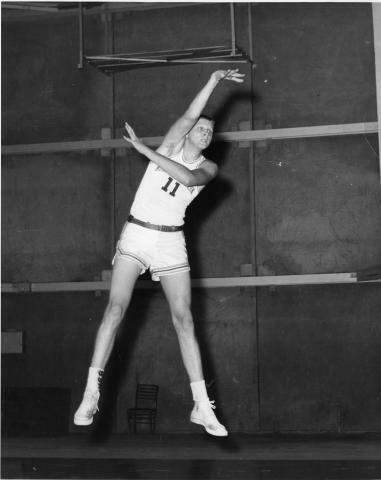 Joe Ruklick (SESP 1959, Medill 1990) has many memories of playing basketball for Northwestern in the late 1950s. Ruklick began playing basketball when he was 12 (and nearly 6' tall), and by his senior year in high school was named a high-school All-American. Then 6'9" and recruited by a number of colleges, he chose Northwestern, where he led the team in rebounding and scoring for three consecutive years. Ruklick's career points per game (19.9) and rebounds per game (13.9) averages remain at the top of NU's record book. In addition to being named an All Big Ten selection (1957-58) and All-American (1958), Ruklick was a reporter for the Daily Northwesternand a member of the Deru honorary society. After graduation, Ruklick was drafted by the NBA Philadelphia Warriors, where he played with Wilt Chamberlain for three seasons. Ruklick will be remembered for assisting on the final points of Chamberlain's legendary 100-point scoring effort in a 169-147 victory over the New York Knicks. After retiring from basketball, Ruklick worked in business and journalism, and served for several years as a beat reporter and associate editor for the Chicago Defender. In 1984, Northwestern University recognized Ruklick as a charter member of its Athletic Hall of Fame. Read more about Joe Ruklick. Joe Ruklick donated his collection of 14 basketball game films to the Northwestern University Archives. Archives digitized the films and now is pleased to be able to provide access to them through this site. These black-and-white, silent films run between 25-40 minutes each, so get some popcorn and settle in for some good viewing of remarkable players, teams and games.